CELTIC captain Scott Brown has laughed off the abuse he received at Pittodrie after scoring the goal which completed a clean sweep of victories for the Scottish champions against Aberdeen this season. Missiles, including a pie, were thrown at Brown from among the Aberdeen fans in the Merkland Road stand as he celebrated his 49th-minute strike. 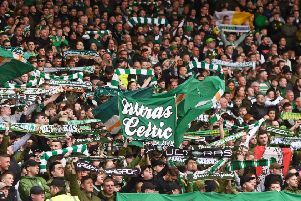 The Scotland midfielder was jeered throughout the afternoon by the home support but emerged unfazed after the 1-0 win which stretched Celtic’s lead over their closest rivals at the top of the Premiership table to 14 points. “Someone threw a pie at me and I was going to eat it but it fell out of my hands,” smiled Brown. “That’s probably just as well, because the gaffer wouldn’t have liked it – there’s too many carbs in it. It might have given me a bit of extra energy but I couldn’t grab it. “If someone had thrown money I would have picked it up – I’m from Fife after all. That would have bought me a pie back home. “These things happen. I don’t pay too much attention to it. It’s banter and for 90 minutes they can give me as much as they want, it doesn’t bother me. If someone had thrown money I would have picked it up – I’m from Fife after all. Brown has had a highly influential season for both club and country, although he has also attracted controversy after he was pictured slumped on a pavement eating fast food after a night out in Edinburgh in the build-up to the League Cup final in March. But Celtic manager Ronny Deila, while unhappy at that incident, has come to value Brown highly. After his latest telling contribution yesterday, Deila hailed his skipper as the ideal role model for the rest of his players. “You know what you get from Broony every time,” said Deila. “He is a class player and is someone you just love to have on your team. I understand that people outside our team don’t like him so much because he’s so good. He gets abuse from other fans but that is a compliment for him. He is used to it now, I think he enjoys it rather than uses up his energy on it. He’s very strong mentally so it doesn’t bother him. “He is a fair player. He’ll go tough into challenges but he’s also fair. Scott loves winning and is great with his team-mates. He is a role model inside the dressing room and what you want. “You need strong characters to play for this football club and he is one of them. When he puts on a Celtic strip he’s a big character and he makes performances. Deila was hugely satisfied by his team’s attitude at Pittodrie, despite having already secured their league title triumph the previous weekend. “Aberdeen played very well today so it is a very good achievement to beat them four times this season. They have had a very good season so we’re pleased to have that record against them. “We had the championship won before the game but the effort the players put in was unbelievable. I am very, very pleased about it. We have a very big task ahead of us with the Champions League qualifiers in July. So every game we play, we have used to develop ourselves and try to improve.